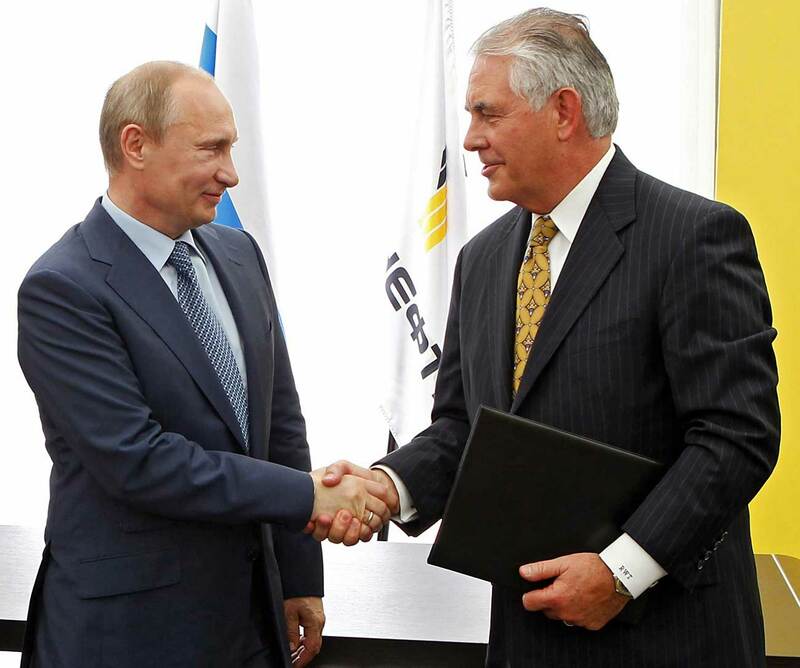 Russian President Vladimir Putin and ExxonMobil CEO Rex Tillerson shake hands at a signing ceremony of an agreement between state-controlled Russian oil company Rosneft and ExxonMobil at the Black Sea port of Tuapse, southern Russia, June 15, 2012. The Kremlin understands that if Rex Tillerson is confirmed as the next U.S. Secretary of State, his line will be tough but expects that he will listen to Russia’s arguments, presidential spokesman Dmitry Peskov told reporters on Wednesday, Jan. 11. In comments to Tillerson’s opening statement released before Wednesday’s confirmation hearing at the Senate Foreign Relations Committee, Peskov said Moscow’s positive opinion about Tillerson was due to his professional qualities, his consistency and constructive rigidity in asserting his interests. "This does not mean that we wear rose-colored glasses. We understand that naturally, Mr. Tillerson will continue being a rather tough person in pursuing his line." "At the same time, we would certainly like to appreciate his readiness to listen to arguments of the opponents," Peskov stressed. The Russian side was and will be ready to have a well-argued position and explain sensitive issues to vis-a-vis. "This is the most valuable quality," Peskov said, asking to wait until Tillerson delivers his speech. The Washington Post wrote that in his opening statement Tillerson will say that Russia poses a danger for the U.S. "but it is not unpredictable in advancing its own interests." "We need an open and frank dialogue with Russia regarding its ambitions, so that we know how to chart our own course," Tillerson will say. Russia is mentioned nine times in this statement, including among the threats to the U.S.
Tillerson, 64, the CEO of U.S. oil and gas giant ExxonMobil, was picked by Donald Trump as the Secretary of State in mid-December.